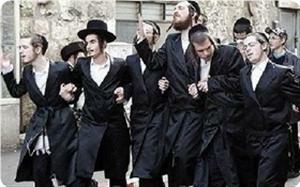 Around 15 Jewish extremists attacked on Sunday morning a 37-year-old Palestinian cleaner in Tel Aviv, Palestinian sources reported. The group of extremists hit Hassan Ausruf, from the city of Yafa in the center of the Palestinian 1948-occupied territories, with bottles on his head and all over his body while he was working in the Yarkon Street in the city of Tel Rabia (Tel Aviv), and then fled. Ausruf's wife said that when her husband asked the settlers why they were attacking him, they told him 'because you're an Arab'. "They attacked him with whatever they could get their hands on, bottles and shards of glass and they inflicted serious wounds to his head and in one of his eyes," she added. Medical sources added that Ausruf was treated at Wolfson Medical Center for skull fractures and serious injury in his left eye and that he underwent a surgery in the head. 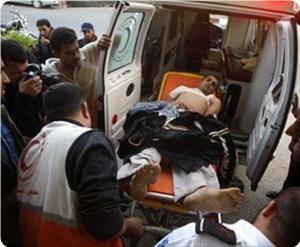 Medical Director of Rafidia Hospital in Nablus, Dr. Osama Malhees described the medical condition of the Palestinian man wounded by Israeli fire on Saturday in Nablus as "difficult and critical." He stressed that he underwent several surgeries in Rafidya hospital after being shot by an explosive bullet in the stomach during clashes with Israeli forces on Saturday. Dr. Malhees confirmed that the young man Hilmi Abdul Aziz Hassan, 27, from Qasreh village south of Nablus in the northern West Bank, is in the coma and he may undergo other surgeries. 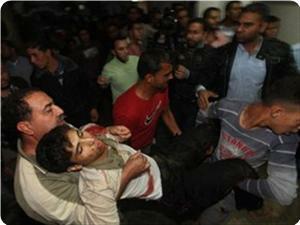 Due to his critical condition, the wounded will be transported to Hadassah hospital in occupied Jerusalem for treatment. The occupation forces have injured Hassan and six other people during breaking into their village yesterday after a settlers' attack on them, where the settlers have destroyed six vehicles, uprooted and destroyed more than 180 olive trees in addition to some houses' furniture in the area near the settlements surrounding the village. The Palestinian child Uday Hatem Zakarneh, 16, was injured on Sunday evening, where his leg was broken after an Israeli military vehicle ran him over during chases at Jalama checkpoint north of Jenin, while 6 others were wounded by rubber bullets and dozens by gas bombs. Israeli soldiers deliberately ran over a child while he was standing with a group of boys during the clashes, in an attempt to terrorize the participants in the clashes, eyewitnesses stated, noting that Dr. Khalil Suleiman transported him to hospital for treatment. Six other young men were injured by rubber bullets during clashes after the murder of the prisoner Jaradat in Israeli jails and in protest at the hunger strikers' deteriorating conditions. The medical sources in Jenin confirmed that there are more than 50 suffocation cases due to inhaling the Israeli tear gas during the clashes at the checkpoint. Israeli special forces assaulted a number of worshipers in the holy Aqsa mosque, the Aqsa Foundation for Endowment and heritage said on Monday. 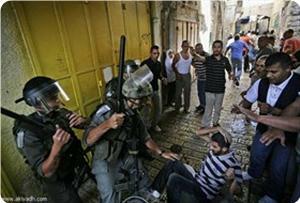 It said that the worshipers confronted the Israeli forces’ attempt to break into the Qibli mosque, the old Aqsa mosque, which triggered limited confrontations with no injuries or arrests reported. The foundation said that tension was still running high in the holy site due to the Israeli forces’ determination to storm the Qibli mosque to force young worshipers out of it. A Palestinian man was shot and wounded to the east of Jabalia, north of the Gaza Strip, at noon Sunday at the hands of Israeli occupation forces (IOF). Dr. Ashraf Al-Qudra, the health ministry’s spokesman, told the PIC reporter that IOF soldiers stationed to the east of Jabalia opened machinegun fire at civilians wounding a 36-year-old man. He said that the man was taken to hospital where doctors described his injuries as moderate. 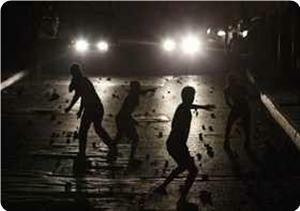 Meanwhile, Israeli warplanes launched mock raids over various areas of the Gaza Strip. A field observer told Quds Press that the raids, which caused big bangs, were made at a time when Gaza masses were walking in the streets of the enclave in a protest march against the death of a Palestinian prisoner in Israeli occupation jails on Saturday. The Israeli Special Forces attacked 17-years-old Azmi Abu Mayale, beating him badly while he was near the Sahira gate in Jerusalem. 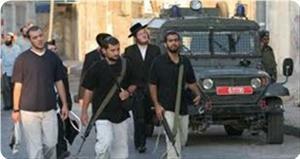 Eye witnesses said they attacked a few young men from Jerusalem who were near the Rashidiye school in Bab al Sahira. They were having an argument, which the forces interfered by pushing them before they attacked Azmi. He lost consciousness and was transferred to the hospital via ambulance. Israeli occupation forces (IOF) fired rubber bullets and teargas at Palestinian young men who marched outside Jenin city on Sunday in protest at the death of a Palestinian prisoner in Israeli custody. Local sources said that the youths threw stones and empty bottles at the soldiers manning the Jalama roadblock, north of Jenin. They said that special units chased the young men into the outskirts of Jenin city, adding that PA patrols were seen trying to persuade the youths not to engage in confrontations with the IOF. Meanwhile, IOF soldiers stormed the village of Yabad at dawn Sunday and broke into a house that is still under construction. Locals said that the soldiers questioned the owner of the house after searching it and arrested a number of citizens and interrogated them inside it. 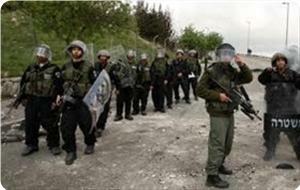 Local sources said that IOF soldiers raided three other nearby villages. Violent clashes broke out on Sunday between hundreds of citizens and school students on the one hand and the occupation forces on the other in different parts of al-Khalil in the West Bank following the martyrdom of the prisoner Arafat Jaradat in an Israeli prison. In Fawwar Camp, south of al-Khalil, violent clashes erupted between Palestinian youths and the occupation forces who stormed the camp's entrance and fired tear gas and metal bullets towards citizens, eyewitnesses confirmed to PIC reporter. At the entrance to the town of Beit Ainun northeast of al-Khalil, dozens of students have organized angry marches protesting the killing of the prisoner Jaradat under torture in Israeli jails, where the IOF suppressed the demonstration. Violent clashes broke out in Beit Ummar, north of al-Khalil, after the occupation fired tear gas within a school for girls, leading to dozens of suffocation cases among the students, member of Popular Committee told PIC reporter. Arroub camp has also witnessed violent clashes when the camp citizens confronted the occupation forces who tried to storm their homes, where soldiers fired tear gas intensively, the Popular Committee in Arroub Camp stressed. 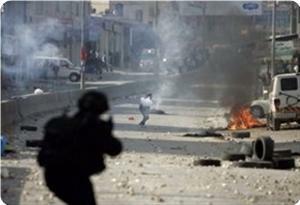 Fierce confrontations took place in Bab al-Zawiyeh where hundreds of citizens threw stones and empty bottles on the IOF in protest at the murder of the prisoner Arafat Jaradat in Israeli jails, where soldiers fired tear gas and metal bullets, a number of injuries were reported. Youth groups and organizations and the resistance factions called for a day of rage on Sunday to protest Jaradat's murder. Meanwhile, popular marches were organized in Gaza City on Sunday afternoon condemning the murder of the captive Arafat Jaradat from the city of al-Khalil during interrogation in Megiddo Prison. A number of Islamic and national factions led by Hamas and Islamic Jihad movements participated in the angry marches, PIC reporter stated. The protestors set off from the Saraya junction towards the Legislative Council Building, opposite which dozens of citizens who participated in the march rallied, calling for the need to put an end to the occupation’s illegal practices against the prisoners, especially the hunger strikers. National forces in the city of Jenin have declared on Sunday a comprehensive strike, except schools, to mourn the martyr Arafat Jaradat, who died in mysterious circumstances yesterday in Megiddo Prison, and in solidarity with the striking prisoners in Israeli jails. The martyr Jaradat was mourned by loudspeakers across the city of Jenin, amid popular condemnation and accusations to the occupation, calling for continuous protest sit-in in Jenin in solidarity with the prisoners' hunger strike. Moreover, the Israeli occupation authorities announced on Sunday a state of alert in the occupied West Bank, in anticipation of clashes following the murder of the prisoner Arafat Jaradat. Israeli occupation government chief of staff, Benny Gantz, instructed the army to maintain a high level of preparations in anticipation of the Palestinian continued demonstrations and protests, for fear of the outbreak of a new uprising following the martyrdom of the Palestinian prisoner in the Megiddo prison. Senior military officers will participate this week in a special meeting to study all possible scenarios in the Palestinian territories. Yediot Ahronot Hebrew newspaper warned against the deteriorating security situation in light of the escalating clashes in different parts of the Palestinian territories. The newspaper quoted Israeli security sources as saying: "The Palestinian Authority will not allow the situation escalating before the visit of U.S. President Barack Obama to "Israel" and Ramallah next month. "Israel has reportedly relayed a communiqué to the Palestinian Authority, via Prime Minister Benjamin Netanyahu's confidant Attorney Yitzhak Molcho, demanding it take all necessary measure to calm the situation on the ground," the newspaper stated. In the same context, Haaretz newspaper confirmed that Israeli officials are convinced that the region is on the threshold of "new uprising" as a result of the violent clashes taking place in the Palestinian territories. Israeli police forces quelled on Saturday afternoon a Palestinian demonstration in occupied Jerusalem in support of hunger striking prisoners. Mohammed Abul Humus, a member of the committee for the defense of land in Issawiye village, said that two participants were detained at the pretext of “resisting” occupation and hoisting photos of hunger strikers. 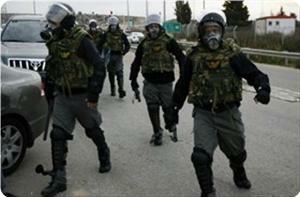 He said that Israeli policemen assaulted the march and took a number of marchers to a nearby police station. The Israeli policemen also severely beat up a Palestinian youth during confrontations with young men near Rashidiya school. Locals said that the Israeli police arrested three young men after quelling the demonstration and leveled fines against them. A Palestinian university student was hit with an Israeli bullet in the head north of Ramallah on Saturday night and went in a coma. 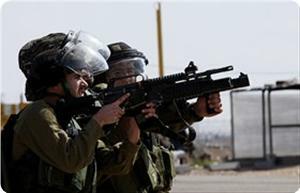 Eyewitnesses said that Israeli occupation forces (IOF) fired at a demonstration in solidarity with Palestinian prisoners in Abud village, north of Ramallah, and wounded four young men. They said that 21-year-old Mohammed Asfur, a student at Quds University, was seriously wounded in the head, adding that an Israeli sniper fired a bullet at him that hit his head and broke his skull. They said that another young man was hit with a bullet in his knee, adding that the other two were slightly wounded. The wounded were carried to Rafidiya hospital in Nablus after IOF soldiers closed the northern entrance to Abud village preventing the ambulance cars from taking them to Ramallah government hospital. A UN report recorded a significant increase in violent clashes between Palestinian demonstrators and Israeli forces during the last week. The Office for the Coordination of Humanitarian Affairs of the United Nations (OCHA) said in a press release on Saturday that "these clashes were in the context of multiple protests held in solidarity with Palestinian prisoners in Israeli detention facilities who are currently on hunger strike." OCHA's report showed that over 120 Palestinians, including 19 children, were injured during the West Bank's clashes, noting that "more than half of (wounded) Palestinians were injured by rubber-coated metal bullets; others sustained injuries as a result of being hit by tear gas canisters, were hit by Israeli forces or suffered from tear gas inhalation." This week, OCHA documented six settler-related incidents that led to one injury and damage to Palestinian property. The Jerusalem Municipality demolished a one-story house in Beit Hanina town in East Jerusalem on the grounds that it was built without an Israeli-issued building permit, which led to the displacement of two families composed of nine members, including five children. OCHA said it was the 8th building demolished in East Jerusalem since the beginning of 2013, compared with 24 buildings demolished in 2012. Additionally, the Israeli military issued evacuation orders against 25 dunums of land in the village of Nahhalin and 30 dunums of land in the village of Husan (both in Bethlehem), on grounds that the land has been designated ‘state land'. More than 20 Palestinians sustained injuries when the Israeli occupation forces (IOF) attacked a congregation of Palestinian worshipers after they finished their Friday prayers outside Ofer jail, south of Ramallah city. The Palestinian information center (PIC) reporter in the city said two Palestinian young men and one female paramedic suffered injuries from live bullets, while many others suffocated from tear gas. He said that violent clashes broke out throughout Beitunia town, and the IOF invaded the southern neighborhoods near Ofer jail and deployed snipers on the roofs of some houses. 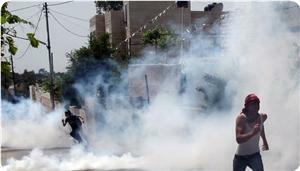 Several young men suffered tear gas injuries during the confrontations. 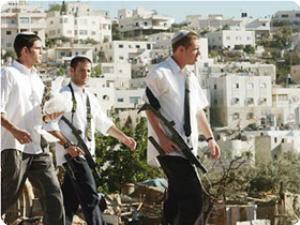 Jewish settlers, studying at a religious school in Kiryat Arba to the east of Al-Khalil, attacked Palestinian homes in Wadi Nasara suburb in Al-Khalil on Saturday morning. Inhabitants said that groups of Jewish students, walking from Kiryat Arba to the Ibrahimi mosque, threw stones and empty bottles at Palestinian homes injuring 14-year-old child Saadi Jaber. 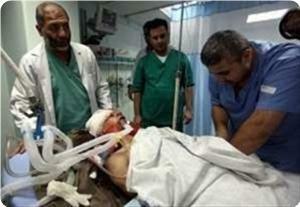 They said that Saadi was taken to Al-Khalil government hospital with moderate injuries. Confrontations were reported after the incident between young Palestinian men and those settlers along with Israeli occupation forces, they said, adding that IOF soldiers chased Palestinian youths in the nearby alleys and cordoned off the area. Inhabitants in Yabad village, south of Jenin city, clashed with Israeli occupation forces (IOF) that stormed their village on Friday night. Local sources said that dozens of young men confronted the invading IOF troops that broke into many suburbs, bringing tension anew to the village that has been the target of similar intermittent attacks over the past week. They said that a number of citizens were treated for breathing difficulty as a result of the IOF use of teargas, adding that the soldiers arrested a 14-year-old child, Wasim Abu Bakir, and took him to a detention center. 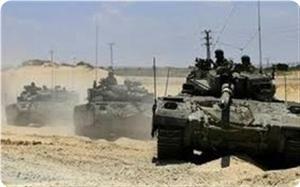 Two Palestinian citizens were wounded at the hands of Israeli occupation forces (IOF) to the east of Jabalia, north of Gaza Strip, on Friday night. Local sources told the PIC reporter that IOF soldiers opened machinegun fire at agricultural fields east of Jabalia injuring the two citizens. Four Palestinians were killed and 75 others were injured in IOF violations of the calm agreement in Gaza Strip concluded late November 2012. Israeli occupation police stormed the holy Aqsa mosque in occupied Jerusalem following the Friday congregation and quelled a pro-prisoners rally. Eyewitnesses told the PIC that the policemen fired rubber bullets and teargas to disperse the worshipers and wounded more than ten of them. 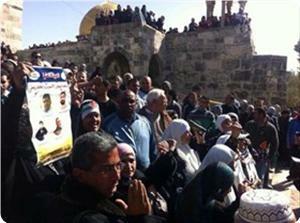 They said that the police forces broke into the holy site from three gates and arrested three worshipers, adding that among the wounded was young girl who was hit with a rubber bullet and a paramedic. Dozens of Palestinians suffocated during clashes that erupted on Friday afternoon in several areas in the center of al-Khalil city, following a mass rally organized by the citizens. Thousands of Palestinians and many political, factional and leading figures participated in the march, which was organized by the Youth against Settlements group to demand opening the Shuhada Street in the Old City of al-Khalil which has been closed since 2000 and to commemorate the 19th anniversary of the Ibrahimi Mosque massacre, in which 29 Palestinian worshipers were massacred by an American Jewish settler while they were performing dawn prayer. According to eyewitnesses, the march was launched after Friday prayers from the mosques of al-Khalil toward Ein Sara and Hussein Mosque and then to the entrance of the Shuhada Street in the area of Bab al-Zawya. The demonstrators raised slogans condemning the policies of occupation, the closure of the street and the seizure of Palestinian houses in the Old City. Israeli soldiers and snipers deployed on the rooftops in Bab al-Zawya, fired tear gas grenades at the demonstrators, leading to the outbreak of violent clashes and state of tension in the center of al-Khalil. 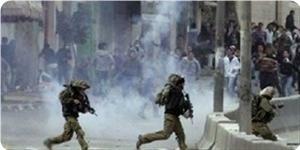 Israeli military and police forces raised the alert status among their ranks in West Bank and occupied Jerusalem, in light of the possibility of the outbreak of clashes and demonstrations to condemn the continued detention of hunger striking Palestinian prisoners in Israeli jails. Hebrew radio reported on its website on Friday that the Israeli forces declared a state of alert across the West Bank and the occupied city of Jerusalem, in anticipation of clashes that may erupt after Friday prayers, as marches called for by the Palestinian factions are scheduled to take place in solidarity with hunger strikers in Israeli jails. Palestinian human rights activists have launched a judicial battle against the Israeli state, to stop its evasion of compensating the families of Palestinian victims killed by its soldiers. The Knesset has approved, on the 23rd of last July, Civil Damages (State Liability) Law amendment No. 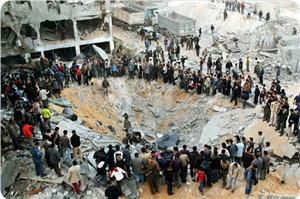 8, which denies Palestinians the right to receive compensations for damage caused by Israeli security forces. It applies under all circumstances. Raji Sourani, Director of PCHR, said that such tactics employed by the Israeli judiciary deny Palestinian victims the right to access justice and the right to an effective remedy with respect to both civil and criminal cases. He asserted that such measures very strongly indicate Israel’s unwillingness to fulfil its legal obligations towards the victims of its military operations through its domestic mechanisms. Sourani told Quds Press Agency that recourse to international justice mechanisms, such as the International Criminal Court, is essential for achieving justice and accountability for Palestinian victims, thereby tackling Israeli impunity and ensuring respect for the rights of Palestinians in the future. Israel classifies the entire occupied Palestinian territory as a ‘conflict zone’ and, since 2007, Israel has prevented Palestinians living in the Gaza Strip – whether victims, witnesses, or their lawyers – from travelling to appear before Israeli courts. As a result, the courts have dismissed many cases under the pretext of the complainants and witnesses not being present during the proceedings. Amendment no. 8 directly contravenes norms of customary international law, which establish that a State (in this instance Israel) is responsible for all acts committed by persons who are operating as part of its armed forces. Moreover, as a High Contracting Party to the 1949 Fourth Geneva Convention relative to the Protection of Civilian Persons in Time of War, Israel cannot be absolved from any liability it incurs in respect of grave breaches or serious violations, which are committed against the civilian population during military operations. Fayez Salha, a Palestinian citizen whose wife, four children and sister-in-law were killed as Israeli forces bombed his home in 2009, has sued the occupation demanding financial compensation, but the Court decided to dismiss the lawsuit filed by Al Mezan Center for Human Rights, and fined the plaintiffs 20000 shekels. Fayez said he is planning to go to the Palestinian Presidency to demand it to defend his case, demanding the PA President to take it "seriously". He has also threatened to escalate the judicial procedures, expressing surprise at the international community's silence regarding such Israeli measures. For his part; Issam Younis, Director of Al Mezan Center for Human Rights, stressed on the liability of the international community, especially the Contracting Parties to the Fourth Geneva Convention. More than 70 Palestinians were injured on Thursday in violent confrontations with the occupation soldiers outside the Ofer detention center south of occupied Ramallah. The Palestinian Red Crescent said in a statement that at least one person has been injured with live ammunition, and 26 injuries with rubber-coated metal bullets, while the rest of the injuries were due to tear gas. Students from Birzeit University, the University of Jerusalem, and secondary schools have participated in marches to Ofer prison, where clashes have erupted. The Israeli occupation has declared the area since early morning a closed military zone, where the occupation soldiers were deployed within a 1-square-kilometre area and seized the rooftops of some houses around the prison. The Israeli soldiers used a bulldozer to open roads closed by demonstrators in addition to the use of water cannons using wastewater against the protestors. Israeli officers, border guards, and Israeli police were attended in front of the Ofer prison since the early hours to suppress the demonstrators and prevent them from having access to the prison gate. The leader of the Islamic bloc in Birzeit Imran Mazloum told PIC reporter that hundreds of people, including students from the University of Birzeit, have participated in a massive march to the Ofer prison west of Ramallah in support of the prisoners on hunger strike, where the IOF have repressed them with tear gas and rubber-coated metal bullets, leading to several cases of suffocation and the outbreak of violent clashes in the region. The Popular Committee Against the Wall has called for holding the Friday prayers outside the Ofer prison in solidarity with the prisoners on hunger strike. Mazloum said that Birzeit student blocs have organized events in support of prisoners in front of Ofer prison gate, since few days ago, where many of them were injured. 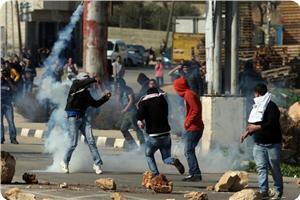 Different areas in the West Bank have been witnessed clashes and confrontations at the entrances to towns and camps. Israeli settlers continued their attacks in different areas of the West Bank, where they attacked, after midnight, Palestinian houses and vehicles in the village of Kasra south of the city of Nablus, causing panic among the citizens. Ghassan Daghlas, a Palestinian official in charge of settlements file in the northern part of the West Bank, confirmed that dozens of settlers from Yash Codich settlement adjacent to the village attacked the village amid intensive shooting, where they set fire to six vehicles owned by the villagers, leading to the outbreak of clashes between the two sides. The village's residents have confronted the settlers and forced them to leave the village, before the coming of a large force of the occupation army to the village, Daghlas explained. Clashes broke out on Wednesday in the village between the citizens and the occupation forces, injuring eight civilians, while the Israeli army claimed that two soldiers were injured. 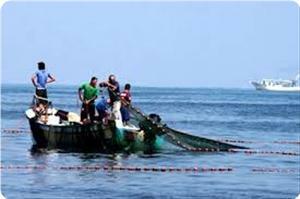 A Palestinian fisherman was moderately wounded on Thursday afternoon after an Israeli navy gunboat fired at his fishing boat off the northern coast of Gaza Strip. 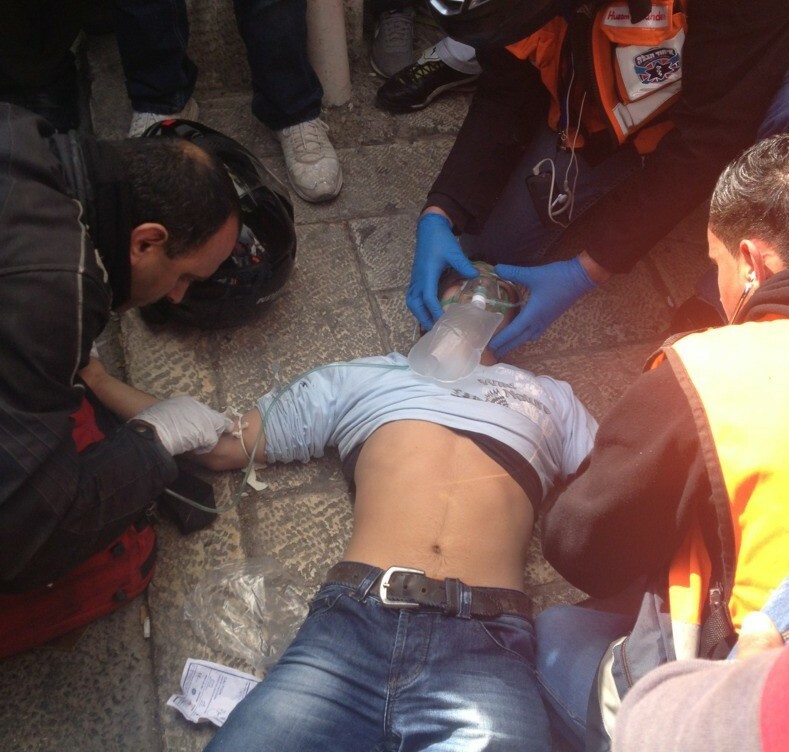 Eyewitnesses told the PIC reporter that Ayman Kabaja, 34, was hit with a bullet and carried to hospital. The Israeli navy continues its chase of Palestinian fishermen and their boats off Gaza despite the calm agreement reached with Egyptian patronage. 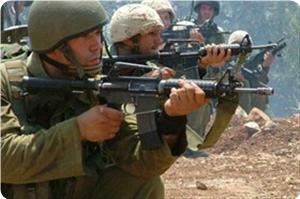 Israeli occupation forces (IOF) raided southern Gaza Strip at dawn Thursday amidst intermittent shooting. A field observer told Quds Press that six bulldozers advanced into eastern Khan Younis and bulldozed land near to the border fence. Meanwhile, IOF soldiers manning the Kissufim military outpost, to the north east of Khan Younis, opened machinegun fire at cultivated land lots to the east of Qarara town. IOF soldiers routinely violate the calm agreement concluded late last year and launch incursions and open gunfire on daily basis. Four Palestinians were killed and dozens were wounded in those violations while 40 fishermen were detained, with their boats, or injured in Israeli navy attacks that also wrecked a number of fishing boats off the coasts of Gaza. Israeli occupation forces (IOF) stormed Burqin village, west of Jenin, at a late night hour on Wednesday after surrounding the entire village and isolating it from the outside world. Local sources said that the large-scale military operation started at night to arrest Samed Abul Haija, from Yamon village, who was hiding in Burqin after learning that the IOF was looking for him for the past four months. 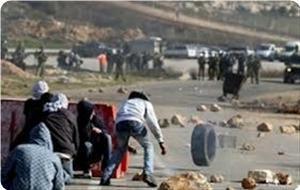 They said that the soldiers were faced with a barrage of stones and empty bottles by citizens protesting his arrest. The sources pointed out that the soldiers fired rubber bullets and gas and sonic bombs at the crowd injuring a young man in his thigh, who was taken to Jenin government hospital, while dozens others were treated for gas suffocation on the field. 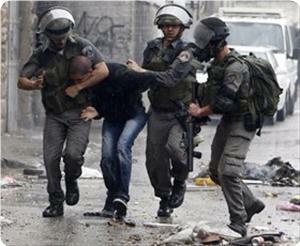 The sources said that the soldiers also arrested Mohammed Al-Saadi, from Jenin refugee camp, in the same raid. 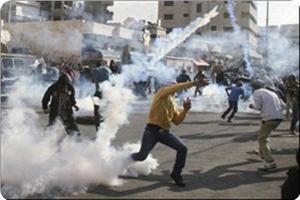 A number of Palestinian citizens were treated for breathing problems after Israeli occupation forces (IOF) fired teargas at them in Qasra village, south of Nablus, on Wednesday. Eyewitnesses told the PIC that IOF bulldozers damaged part of the power grid supplying electric current for the southern areas of the village. 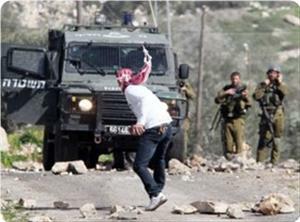 They said that IOF soldiers attacked the young men who tried to stop the bulldozers from carrying out their destruction. The locals said that at least four young men were injured in the soldiers’ attack while a number of others were treated for teargas suffocation, adding that the soldiers blocked ambulance crews from approaching to treat the wounded. The Palestine center for prisoners’ studies said that Israeli special forces raided ward 9 in the Negev desert prison at dawn Wednesday for the 8th time since start of 2013 and thoroughly searched room 9. Director of the center Riyadh Al-Ashqar said that prisoners contacted him from the prison and told him that the special forces suddenly broke into the ward and targeted room 9 that comprises ten administrative detainees. He said that the soldiers forced all ten prisoners out of the room in the cold weather without allowing them to take covers or heavy clothes with them. The soldiers rummaged through the prisoners’ belongings and damaged many of them and tore their mattresses and covers at the pretext the prisoners were hiding mobile phones inside them, Ashqar said. He said that after few hours of search the soldiers told them that their room would be closed and turned into solitary confinement ward until further notice, adding that the soldiers took all electric appliances from the room as punishment for the prisoners despite not finding anything of what they were searching for. Ashqar lashed out at the Negev prison administration for escalating its targeting of the Palestinian prisoners, recalling that the storming operation on Wednesday was the 8th this year. He said that the special forces used police dogs in their search operations. Clashes erupted on Wednesday afternoon between Palestinians and Israeli forces at the southern entrance to the city of Nablus in the northern West Bank, near the Hawara military checkpoint. Eyewitnesses reported that dozens of Palestinian youths and school students staged a march towards al-Quds Street, in the south of Nablus, then close it and set fire to tires. 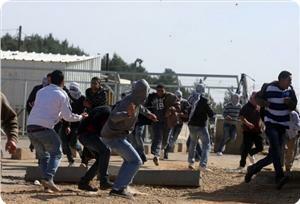 The clashes erupted afterwards at the Hawara checkpoint, near the street. The witnesses added that the occupation soldiers fired rubber bullets and tear gas and stun grenades towards the young men and Palestinian boys, causing a number of them to suffocate. 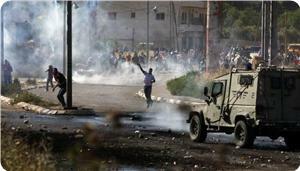 Different areas in the West Bank have been witnessing, for the third consecutive day, clashes between Palestinians and occupation forces, especially in points of contact at the entrances to Palestinian cities, in protest against the Israeli ongoing violations against the prisoners and in solidarity with the hunger strikers who have been suffering seriously deterioration in their health amid occupation refusal to release them. Other confrontations took place in Qusra village near the city of Nablus following the demolition of an electricity network. The Israeli soldiers fired rubber bullets and tear gas and stun grenades at the protestors and eight citizens were wounded and taken to the hospital for treatment. Abdel Azim Wadi, head of the village council in Qusra, pointed that an Israeli military force, accompanied by bulldozers, demolished an electricity network, in the south-eastern area in the village that supplies dozens of houses, under the pretext that it is set up in an area under the Israeli control. Meanwhile, Hundreds of Palestinians demonstrated in the southern Gaza Strip on Wednesday in solidarity with Palestinian prisoners on hunger strike in Israeli jails. The demonstrators raised photos of hunger striking prisoners in al-Awda Square in the town of Rafah on the border with Egypt, and urged the international community and its institutions to act in order to save the prisoners' lives. Mohammed Muammar, head of the National Assembly for Democracy and Law, asserted that these activities will not stop as long as the Israeli authorities ignore the rights of prisoners and keeps holding them without legal justification. Tawfiq Abu Naim, head of the Association of Detainees and Ex-detainees, called on the Arab Republic of Egypt to put pressure on the Israeli occupation to oblige it to implement the terms of the agreement signed between the captive movement leadership and the Prison Service administration after the empty stomachs battle. He said in a statement to PIC's reporter on Wednesday that the occupation did not end the policy of solitary confinement, as it was agreed upon, pointing out that the captives Awad Al-Saidi and Dirar Abu Sisi are still held in solitary confinement. The liberated prisoner demanded pressing the occupation authorities to release captive Abu Sisi who had been kidnapped from Ukraine with no charge.